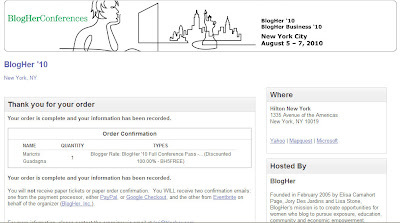 Zensible Mama: It's Official - I'm going to Blogher! 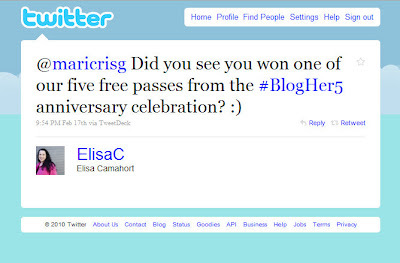 It's Official - I'm going to Blogher! Eversince I heard of BlogHer back in 2008 while in the hilt of getting obsessed acquainted with blogging, I promised myself that one day I would attend this infamous conference. No matter what! 2009 rolled in but was a bad year for me so NO Blogher for me that year. I was bummed. Luckily, 2010 proved to be my year! I can't believe I won! It's one of those tweets that you will never forget. Ecstatic is not enough to describe how I feel about winning the 2 full day pass. Definitely A dream come true! A huge Thanks to Elisa, Jory and Lisa for their generosity and making this happen for me this year. I sure can't wait! My ticket to great knowledge and great fun! All I need now is to find a sponsor to help me with my hotel and travel cost. Are you going? Link up! List your name and Blog URL. I would love to meet you and connect at the conference. Please feel free to link up your Twitter name too! Help spread the word. Please RT or re-post! Congratulations on the fabulous win! Hubby and I are both going to BlogHer. We have to take the opportunity since it is practically in our backyard. Hope to meet you there since I missed officially catching up at Disney. Congrats on your win! I am volunteering and I can't wait! I am so looking forward to my first blogher! Congrats on your win, and thanks for pulling together this list. I'm looking forward to meeting you and all the others here soon.